By Robert P. Granacher, Jr.
597 pages | 46 B/W Illus. 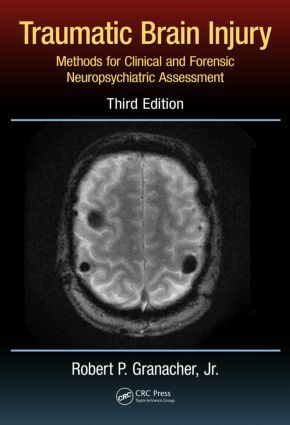 Traumatic Brain Injury: Methods for Clinical and Forensic Neuropsychiatric Assessment, Third Edition provides physicians and psychologists with a scientifically based schema for the clinical evaluation of traumatic brain injury (TBI). The book assists physicians and psychologists in developing treatment plans for patients who have sustained TBIs and also guides those providing forensic analysis to lawyers, insurance bodies, workers’ compensation systems, triers of fact, and other stakeholders in the adjudication of victims of TBI. The procedures and recommendations in this book are grounded in highly referenced evidence-based science but also come from more than 5000 cases wherein the author and contributors have personally examined individuals who have sustained a TBI, or who claim to have sustained a TBI. This edition has been entirely rewritten. The style now follows a more traditional neuropsychiatric format than previous editions. Since the last edition, there has been increased awareness and scientific study regarding the effects of blast brain injury as a consequence of US military experiences in Afghanistan and Iraq. There is also increased interest in the phenomenology of mild traumatic brain injury and, in particular, the forensic complications associated with evaluations of this disorder. Chronic traumatic encephalopathy has also received significant scrutiny in the last decade, possibly associated with sports injuries. This book is a comprehensive resource for clinicians treating patients as well as for forensic specialists. Its purpose remains the same as in prior editions—to provide physicians or psychologists with a practical method for an effective evaluation of TBI based upon known scientific principles of brain-behavior relationships and state-of-the-art clinical, neuroimaging, neuropsychological, and psychological techniques. Robert P. Granacher Jr., MD, MBA, is a clinical professor of psychiatry in the Department of Psychiatry at the University of Kentucky College of Medicine in Lexignton. He also practices privately as a treating neuropsychiatrist and as a forensic neuropsychiatrist. Dr. Granacher obtained his MD from the University of Kentucky, Lexington. He later served as a resident and fellow at Harvard University and the Massachusetts General Hospital and other Harvard University teaching hospitals in Boston. He specializes in the neuropsychiatric treatment and evaluation of traumatic brain injury, perinatal birth injury, toxic brain injury, and other complex neurobehavioral disorders. Dr. Granacher is a distinguished life fellow of the American Psychiatric Association and a member of the American Neuropsychiatric Association.